Today is the 226th Anniversary of the United States Constitution. Want to test your knowledge of the Constitution? Take this online quiz. Learn more about the Constitution using the library’s Constitution Day Online Guide. According to the Blogger statistical package, the Library History Buff Blog has just passed 250,000 page views since it started in November, 2008. I have also just posted my 600th blog post. 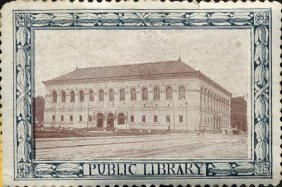 As I indicated in my first blog post: "This blog is my small attempt to increase the appreciation and awareness of our library heritage." 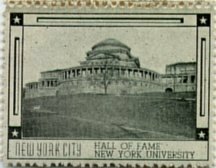 Stamp collectors refer to pseudo stamps or labels with no postal value as "cinderellas". I have a small collection of library cinderellas which is shown below. 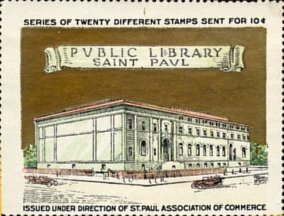 In 1949 the Bookmobile Committee of the Library Extension Division of the American Library Association held seven regional conferences throughout the country to discuss standards for bookmobiles with librarians and manufacturers of bookmobiles. The result was a 1951 report on Bookmobile Standardization. The report provided recommended specifications and equipment for bookmobiles. One of the first bookmobiles to follow these specifications was the Trail Blazer model of the Gerstenslager Company of Wooster, Ohio. 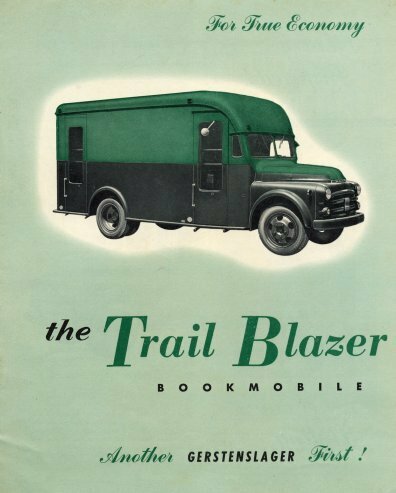 I just obtained a 1953 brochure (see above) that was published by the Gerstenslager Company to introduce and promote their Trail Blazer bookmobile. It was touted as the bookmobile conceived by America's librarians and built and distributed by Gerstenslager. One of the major advantages of the Trail Blazer was that it was designed to be adaptable to chassis that were being produced by all major truck manufacturers. This allowed libraries to request bids from multiple manufacturers. The chassis from the winning bidder was then sent to Wooster, Ohio where the custom body was attached to it by Gerstenslager. 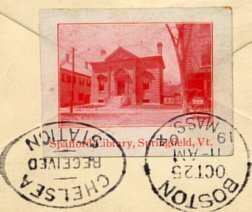 A history of the Gerstenslager Company can be found Here. If you’re looking to buy a tasty lunch today or just want to say hi to the students enrolled in Rachel Lee’s Community Garden Outreach class, the semester’s first campus farmstand will be today (Thursday), from 12:30 – 2 pm in front of the library.